The following very full explanation was provided by John Fairbairn. Sagari is a common Japanese go term also widely used in English. Some English speakers use the term more broadly than the Japanese do. In Japanese it is a verbal noun and the verb form sagaru is widely used. Note: it is essential first to understand the term nobi = stretch to understand sagari. 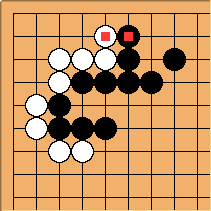 Sagari is used to describe a single move. 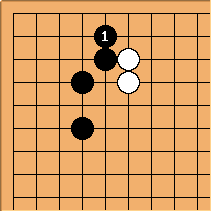 The meaning given in Hayashi's encyclopaedia "Igo Hyakka Jiten" is: "Sagaru refers to a position where a nobi is played towards the edge of the board and not towards the centre of the board." Diagram 1 shows an example. in Diagram 2 is also a kind of sagari but in this case, he says, it is stressing the securing of the corner. These definitions are easier for a Japanese because the verb sagaru is common in the ordinary language. It means fall, drop, sag, decline, etc. A Japanese person therefore has some idea of the meaning even without the help of a go glossary. English definitions often have to be put differently: for example "a descent from the third to the second line, or the second to the first line". Though this way of putting it is common, it evidently does not capture the example of Diag. 2. In translations,words such as descent or dropping down are often used, though not always consistently. 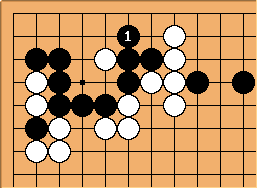 In practice, most references to sagari in Japanese commentaries refer to a move on the second line. 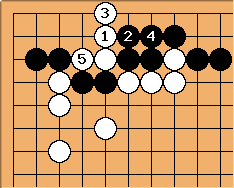 It is, however, possible to use it of moves on the third line (as above) or on the first line. However, when used on the first line there is a strong tendency in Japanese to use an adverbialised form sagarikiri, which can be thought of as meaning something like "sagari to the limit". Furthermore, sagarikiri is very often replaced by orikiri. (Both these terms can ONLY be used of moves on the first line.) Far less often sagaru alone is replaced by its near synonym oriru. None of sagarikiri, orikiru or oriru is ever used in English; if a Japanese term is borrowed, sagari used to cover all cases. Segoe and Go Seigen's Tesuji Jiten (Tesuji Dictionary) has a section on sagari tesujis. Most are second line moves but a couple of first-line examples are shown here. Note that these are described as sagari in this book, but that is probably because they are shown under the general heading of sagari. If they were shown independently it is my (JF's) opinion that they would more normally be called orikiri. Robert Pauli: Isn’t a sagari too? Double sagari? In the latter case only is mentioned in the book as a sagari. Is a sagari too? I would say yes, but of course it's not a tesuji so not worth mentioning specially. (1) Kuro 11 no kakari ni wa, Shiro 'a' no hasami mo arimasu ga, Shiro 12 no sagari ga yuuryoku. (2) Shiro 14 ni Kuro 'b' to wa uchizurai tokoro de, Kuro 15 to mata kakatte kureba, yahari Shiro 16 to sagarimasu. (3) Sagari wa, wakariyasui desu ne. (4) Kuro 2 ni wa Shiro 9 made to uchi, Shiro wa kahen ga ookiku nari, Shiro 'a' no sagari mo nokotte imasu. (5) Kuro 3 to sagareba, Shiro 4 de sumi wo ikimasu. (6) 8 zu no Kuro 5 de, 9 zu no Kuro 1 kata ateru to, Kuro 3 to sagari, Shiro 4 no ate kara Kuro 5 made to narimasu. (7) Kuro 4 ni wa, Shiro 5 to sagarimasu. (8) Shiro 'a' mo uchitai ten desu ga, Shiro 3 no sagari kara Shiro 5-7 no hanetsugi ga ookii deshou. (9) Shiro 16 de wa, 17 ni sagaru te ga arimasu. (10) Kuro 35 wa, kou sagaritai. (11) Kosumitsuke ga yoku nai to shitara, tsugi ni omoiukabu no wa, Shiro 1 no sagari desho. Note that, apart from -kiru, sagaru does not combine with the otherwise common suffixes such as -komu and -dasu. This usage does not seem to occur in English. It's an interesting question whether the second sagari here really is one. 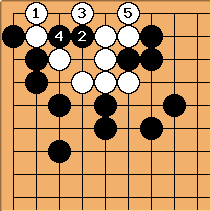 If it was played in a real game, a word such as osae (block) might be preferred. Bill: Is there as second sagari here? Which one is it? I think if a temporal sequence were contemplated, rather than a physical shape, we might be talking about sagari osae. 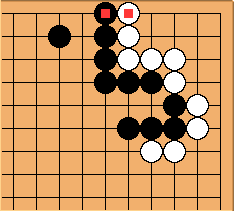 In both cases, the actual play is likely to be hane-tsugi. 2. Sagari also occurs as part of the term burasagari (verb form burasagaru; oriru does not occur in this usage). 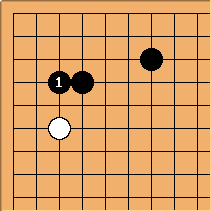 Hayashi's definition is "A sagaru move on the third line from an isolated stone on the fourth line in a narabi shape." Tetchuu (iron pillar) is also a kind of burasagari." He says that tetchuu refers to the case where the burasagari is played under the side star stone. It is obviously a common option in handicap games and the iron pillar imagery is presumably meant to recommend it strongly to the weaker player in such cases. Some westerners use sagari for this example. It would be unusual to do so in Japanese. Other westerners use the terms tetchuu or iron pillar (or variants such as iron post) but apparently without being scrupulous in limiting it to the side star point. hnishy: From a native speaker's viewpoint; Nowadays, orikiri is increasingly rare, sagarikiri still rarer. The most usual expressions are "issen no sagari" (to the first line), "nisen no sagari" (to the second line) etc.